While the goal of the game is to capture victory cities, each power also has an objective related to its historic objectives. These objectives, if achieved, will grant you bonus income. 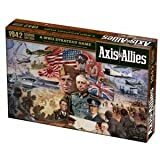 The United States and the United Kingdom, seemed able to meld their individual objectives into one common cause: the complete and unconditional surrender of the Axis. This was also the official position of the Soviet Union, but the Soviets had world communism in mind as well. In recognition of these known national objectives, each country that reaches its individual national objectives will receive a bonus sum of IPCs each turn. Axis powers must control all following territories: France, Northwestern Europe, Germany, Czechoslovakia/Hungary, Bulgaria/Romania and Poland. Axis powers must control at least 3 of the following territories: Baltic States, East Poland, Ukraine, Easter Ukraine, Belorussia. Axis powers must control at least one of the following territories: Karelia, Caucasus. Japan: "The Greater East Asia Co-Prosperity Sphere"
Axis powers must control all following territories: Manchuria, Kiangsu, French Info China/Thailand. Axis powers must control at least 4 of the following territories: Kwangtung, East Indies, Borneo, Philippine Islands, New Guinea, Solomon Islands. 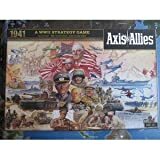 Axis powers must control at least one of the following territories: Hawaiian Islands, Australia, India. Axis powers must control all following territories: Italy, Balkans, Morocco/Algeria, Libya and no enemy surface warships in the sea zones 13, 14 and 15. Axis powers must control at least 3 of the following territories: Egypt, Trans-Jordan, France, Gibraltar. United States: "The Arsenal of Democracy"
Allied powers must control all following territories: Western United States, Central United States, Eastern United States. Allied powers control the Philippine Islands. Allied powers must control at least 3 of the following territories: Midway, Wake Island, Hawaiian Islands, Solomon Islands. United Kingdom: "The British Empire"
Allied powers must control all following territories: Eastern Canada, Western Canada, Gibraltar, Egypt, Australia, Union of South Africa. Allied powers control any territory original under Japan's control. Allied powers control at least one of the following territories: France, Balkans. Soviet Union: "The Great Patriotic War"
Allied powers must control at least 3 of the following territories: Norway, Finland, Poland, Bulgaria/Romania, Czechoslovakia/Hungary, Balkans. No allied forces is present in a territory controlled by Soviet Union.